It’s not often, if ever, that a trainer makes reference to Peppa Pig after enjoying Festival success but Ted Walsh had a lot of things on his mind after watching Any Second Now (6/1) break his duck over fences in the Kim Muir Challenge Cup. Walsh is never one to pull punches and was quick to lambaste the British Horseracing Authority for the whopping bans dished out to amateurs Rob James, Declan Lavery and Noel McParlan (37 days in total) earlier this week. 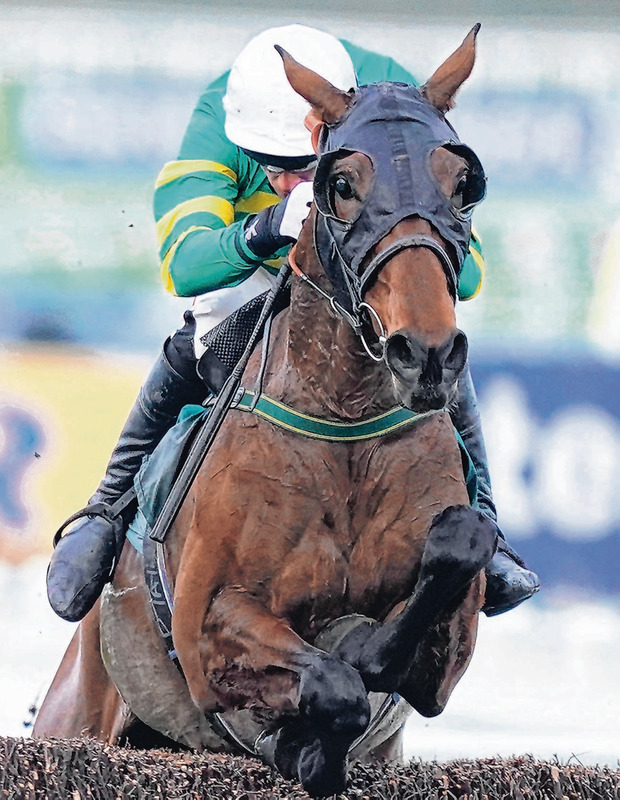 The controversy surrounding amateur jockeys continued yesterday as Irish rider Johnny Barry received a 12-day ban for continuing to persevere on Drumconnor Lad – which fell at the last when tailed off behind Any Second Now – when it was deemed “contrary to the horse’s welfare” by the BHA. “The real thing that sickens me is that the BHA vets examined all the horses afterwards and found them all to be 100pc. How is a jockey supposed to pull a horse up that’s supposed to be third?” the colourful Walsh said of Tuesday’s chaotic National Hunt Chase. “The day they started putting numbers on whip use was the day they backed themselves into a hole that they couldn’t get out of. They should have left it to common sense. If it looks bad, it is bad. “That was a disgraceful decision. The people who don’t want racing, at any level, they will close it down. They’ll modify the fences, do away with the stick, ten years down the road they’ll give out about ground. Having watched son Ruby (59) and daughter Katie (3) visit the winner’s enclosure 62 times since his only previous Festival winner with Commanche Court in the 1997 Triumph Hurdle, Walsh wasn’t all doom and gloom about the state of the game. “Does it compare to Commanche Court? Nothing compares to Commanche Court. He was magic. I loved him as if he was part of the family. He was out of this world. I’d three hundred quid on him at 66/1, at a time when I could badly do with 20 grand. It was also a red-letter day for Bryony Frost as the 23-year-old English jockey secured her second Festival success aboard Paul Nicholls’ gutsy Frodon (9/2) in a thrilling renewal of the Ryanair Chase. Frodon was dead last in the same race 12 months ago but has been rejuvenated under Frost, who became the first female rider to secure a Festival Grade One over obstacles, and she let everyone know how happy she was. “He’s Pegasus, he has wings, and he’s the most incredible battler. When he got overtaken two out, most horses would quit, but he grabbed me by the hands and said, ‘Don’t you dare give up, don’t you dare not send me into the last, I want this more than you, now come on! '” she said. She wasn’t the only woman blazing a trail yesterday, however, as Lizzie Kelly followed her example with success on Siruh Du Lac (9/2) in the Brown Plate Handicap Chase, the 26th by a female jockey at the Festival in total. It was a bold, front-running performance from Kelly on the six-year-old trained by her stepfather Nick Williams – and she joined good female company as the women’s revolution in the weighing room gathers more pace. “It was fantastic watching Bryony. She and Rachael (Blackmore, who won the Close Brothers Handicap Chase on A Plus Tard on Tuesday) are excellent jockeys and are making us perform better. I am delighted we have a really good girls’ weighing room at the moment. With three winners this week, it is very good,” Kelly said. The relief was etched all over the face of Barry Geraghty after he got off the mark for the week aboard Philip Hobbs’ Defi Du Seuil (3/1 favourite) in the Grade One JLT Novices’ Chase as his week took a dramatic turn for the better in one fell swoop. The 39-year-old Meath jockey was celebrating again 40 minutes later after producing a trademark finish to carry Gordon Elliott’s Sire Du Berlais (4/1 favourite) to victory by a neck in the Pertemps and to the head of the Leading Jockey table. “It’s brilliant to get winners here. Not every lad is fortunate to be in a position to ride good horses that can win. “You can see good riders in there who are not riding winners. I’d be feeling sorry for myself not getting a winner the first couple of days,” a relieved Geraghty said. Elsewhere, Cork pilot Noel Fehily steered 50/1 shot Eglantine Du Seuil to victory in the Mares’ Novices’ Hurdle for Willie Mullins before announcing that he intends to retire from the saddle in the coming weeks. The Closutton maestro also trained the second horse home, Concertista (66/1), in his 64th Festival success as he went one ahead of Nicky Henderson.